Australia’s fear of invasion was once again heightened at the end of World War 2 and ‘Populate or Perish’ became a common catchcry. 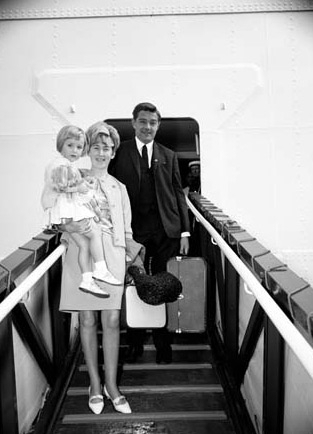 The Federal Government quickly introduced schemes to attract more British migrants. 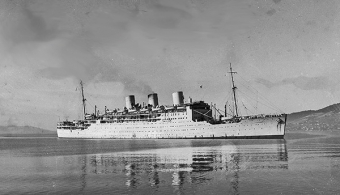 Old passenger liners were refitted with basic accommodation and ‘Ten Pound Poms’ paid £10 for a fare that would normally cost £75 (the equivalent of several months’ wages). 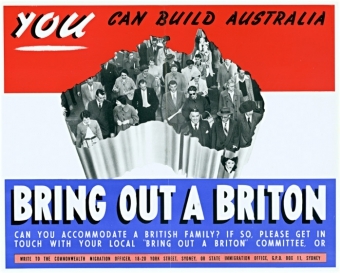 Over the next 25 years more than one and a half million Britons arrived in Australia (although a quarter returned). 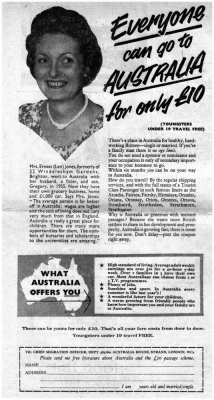 The desire for migrants could not be satisfied by Britain alone and Australia also accepted 170,000 displaced persons from Europe. 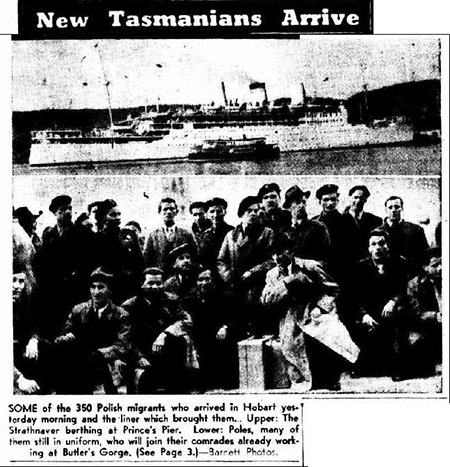 Many Balts, Poles, Italians and Germans were brought to Tasmania in exchange for two years’ work on industrial and public works projects. 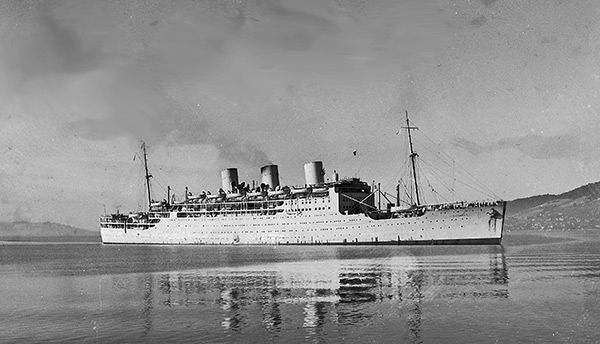 Refugees were closely followed by economic migrants, keen to leave war torn Europe for new opportunities in Australia. Apart from relatively small numbers of Germans and Chinese who arrived in the 1800s, these people were Tasmania’s first large group of non-English speaking migrants. Bill Nicholson was 13 when he asked to be evacuated from Edinburgh to Australia at the onset of war. 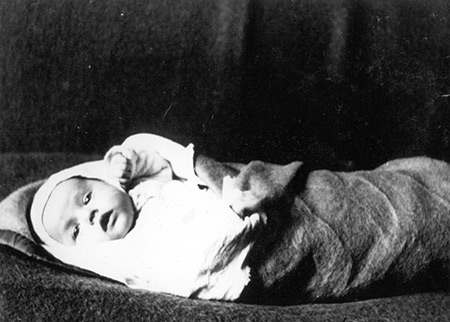 His parents reluctantly agreed and he became one of about 573 children evacuated before German submarines made the voyage too risky. 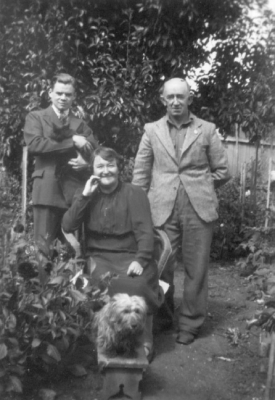 A Tasmanian host family looked after Bill during the War and although he returned home in 1945, nine years later he asked his host family to nominate him as a migrant. He was followed later by his parents and two siblings. 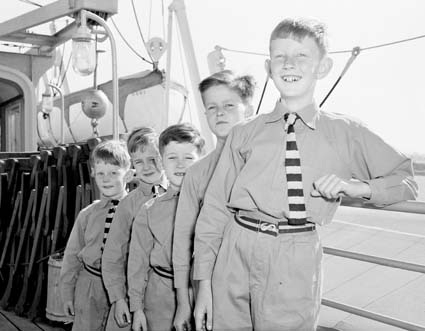 In the post war period few migrants arrived in Tasmania without transhipping in Melbourne. 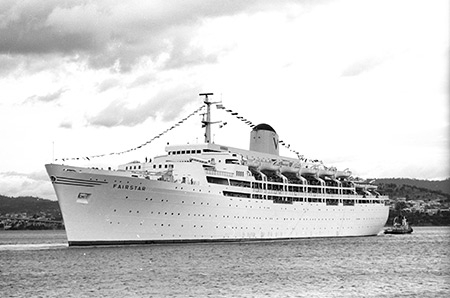 The exception was a voyage by the Sitmar liner 'Fairstar' which arrived in October 1967 and disembarked ninety one assisted migrants for various parts of the State. 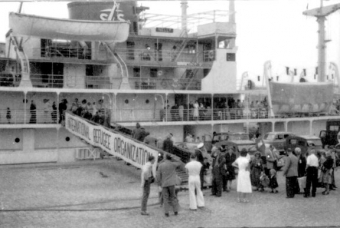 By this time migrants were generally travelling tourist class on regular shipping services or on aircraft. Displaced Persons from Estonia, Latvia and Lithuania were the first refugees to be accepted for resettlement in Australia after the War. As there was a high risk of being shot or sent to Siberia if they returned to their Soviet occupied countries, Reet’s parents lived in a Displaced Persons’ camp until they could be resettled. 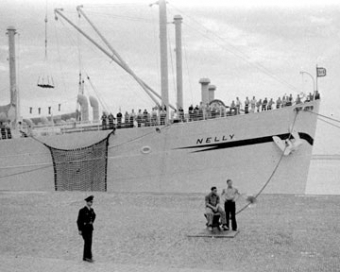 Reet was born in the camp before they sailed to Australia on the 'Nelly'. Her father was put to work felling trees near Scottsdale in northern Tasmania. 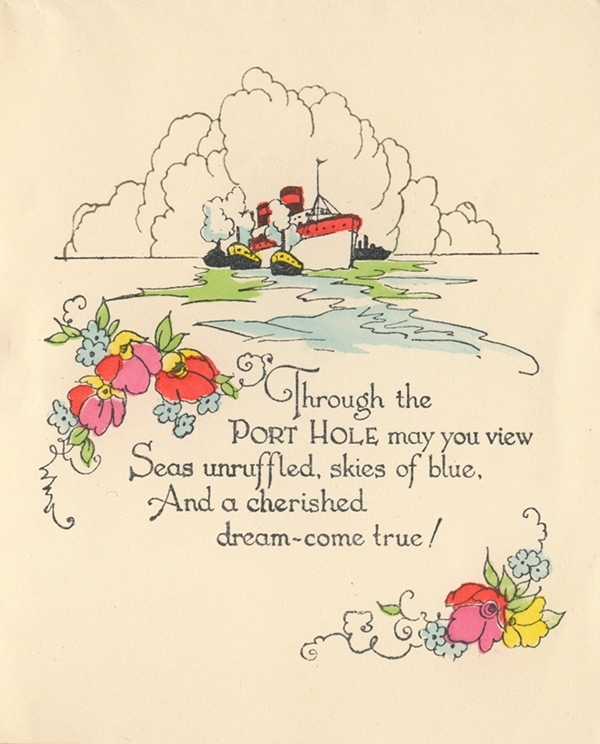 Bob Heggie was an engineer on Port Line vessels which came to Hobart every apple season during the 1950s and 1960s. 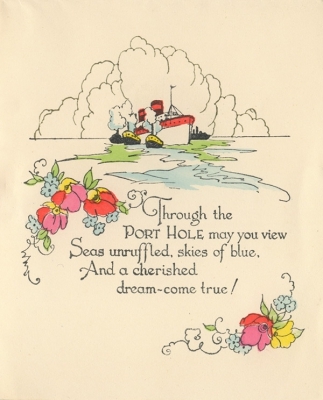 With so many ships arriving for the fruit, they sometimes had to wait up to five weeks for a berth. The crew had plenty of time to meet the locals and Bob was one of many seamen who married Tasmanian girls. 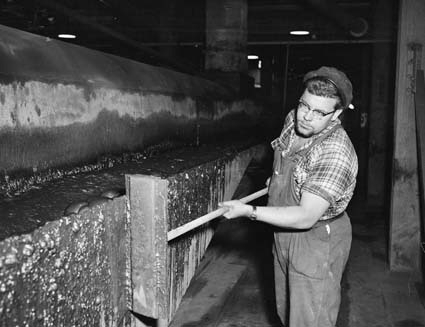 He settled here permanently in 1962. 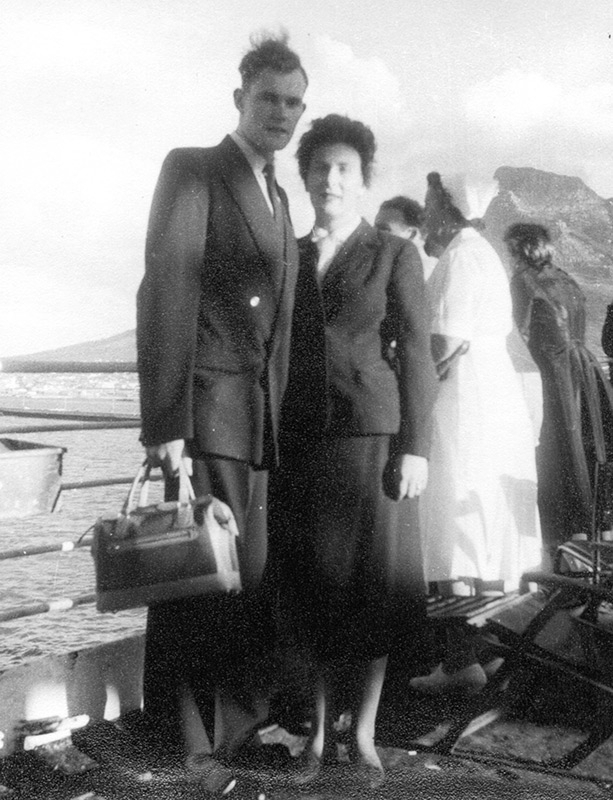 By the 1950s some migrants were arriving by plane. 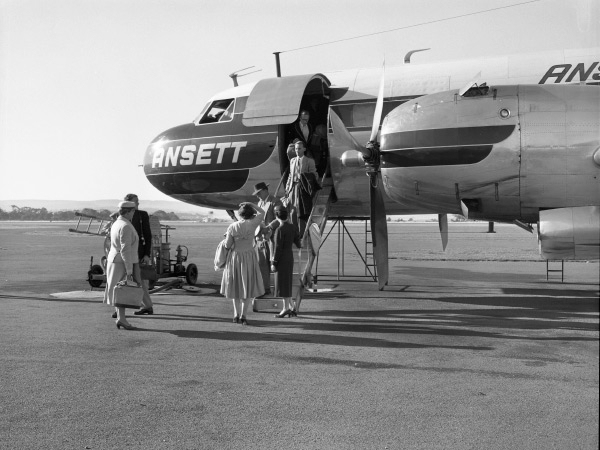 Ansett airline plane landing at Llanherne Airport, Hobart. Tasmanian Archive and Heritage Office. Bill Nicholson, child evacuee, and his host 'aunty' and 'uncle' in Tasmania. 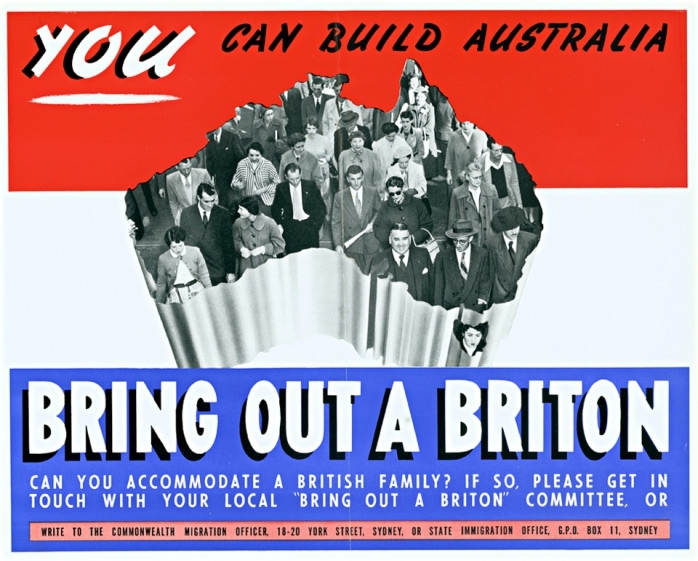 Bring out a Briton The Australian Government launched the 'Bring out a Briton' campaign in 1957. It encouraged the formation of regional committees which would encourage local organisations to sponsor migrants. 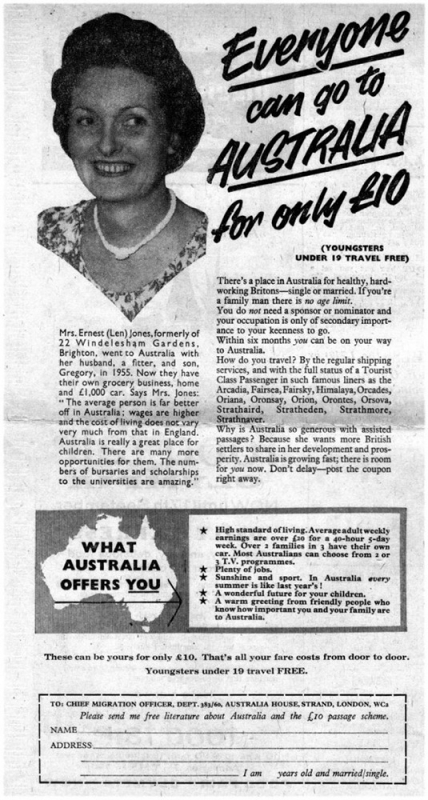 £10 Poms In 1955 newlyweds Bill and Pat Wright spent their honeymoon travelling to Australia as £10 Poms on the 'Georgic'. 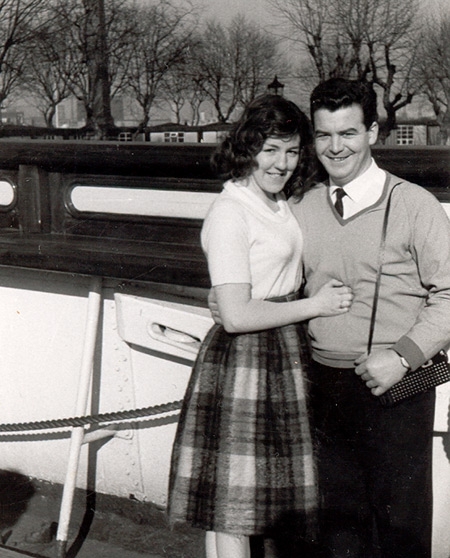 Since accommodation was strictly segregated Bill had to share a cabin with five men while Pat shared with eight women. Fairbridge migrant boys. 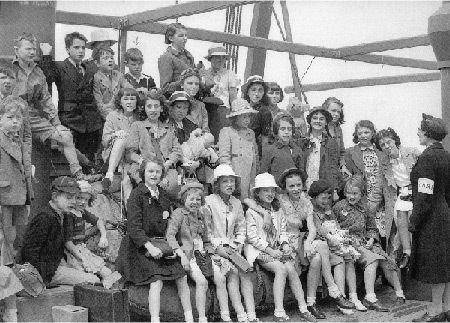 The Fairbridge Society’s aim was to bring deprived slum children from Britain to small group homes in Australia. Here they would have a chance to live in a wholesome environment and to learn useful skills. These boys were the first to arrive in Tasmania to live at a new home established near Launceston in 1958.